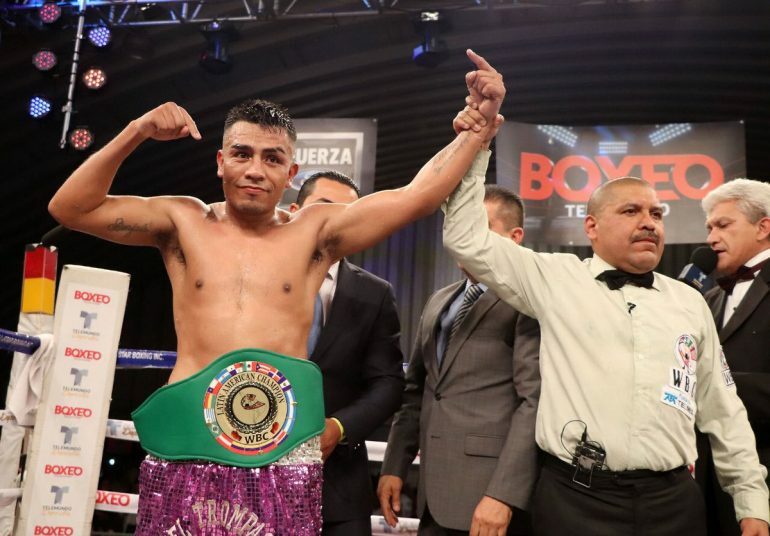 Fringe lightweight contender Mauricio Pintor was able to win a hard-fought unanimous decision over Diego Cruz Friday night at the Deportivo Trabajadores del Metro in Mexico City. The Pintor-Cruz fight was a clash between Mexico City residents who were in desperate need of a win. Pintor, who had not fought since a split-decision loss to Patrick Lopez on Mar. 10 of last year, was the more effective fighter from the opening bell. Pintor connected with several left hooks to the head during the first two rounds. Cruz began to fight from distance in rounds, connecting with lead or counter right or left hands to Pintor’s head. Pintor closed the distance during the sixth round, walking Cruz back up against the ropes and landing several thudding combinations to the head and body. Cruz attempted to mount an offense during the final two rounds, but Pintor landed the telling blows, including several counter left hooks to the head. Scores were 97-93, 97-93, and 98-92 for Pintor, who improves to 21-3-1 (13 knockouts). “I was very motivated for tonight,” said Pintor, who is the nephew of former world titleholder Guadalupe ‘Lupe’ Pintor. Pintor would like to return to the ring as soon as possible. He was inactive between 2013 and 2016, when he was in prison for armed robbery, but was later exonerated after evidence proved he was not involved in the crime. Cruz falls to 18-7-2 (14 KOs) and is now winless in his last five bouts. Another battle between Mexico City residents highlighted the co-feature bout of the All Star Boxing Promotions card. Junior welterweight Cesar Soriano defeated Christian Gomez by unanimous decision victory over eight action rounds. Soriano dropped Gomez during the last 30 seconds of the second round. Gomez attempted to mount an offense during the middle rounds, but Soriano was too strong and accurate. Soriano hurt Gomez with about a minute left in round eight, but was unable to land anything of significance as Gomez held on until the final bell. Scores were 78-73, 77-75, and 76-75 for Soriano, who improves to 14-2, 7 KOs. He has now won his last three fights. Gomez falls to 12-4-1, 5 KOs. Friday night’s Telemundo broadcast was the final installment of the ‘Boxeo Telemundo’ spring season series.